Culture can be defined in many different ways: some use it to describe a combination of tradition/architecture/history of a country, others to describe a specific lifestyle typical to a group. Geert Hofstede refers to it as collective programming, which is also the way we approach the term culture related to brand and personal development. When it comes to branding, we believe that it is important to break free from any cultural conditioning to live what is really unique, to be yourself. 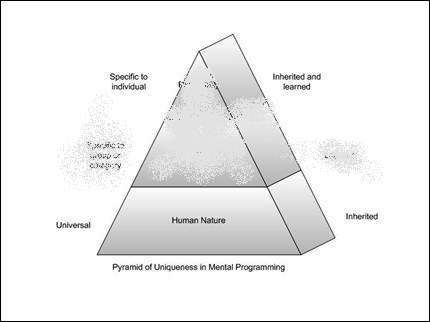 We use an image also developed by Hofstede: the Pyramid of Uniqueness in Mental Programming (Source: http://edoc.hu-berlin.de/dissertationen/willer-ragnar-karl-2006-07-19/HTML/chapter3.html). Our interpretation is that in order to find the real individual uniqueness, one needs to start from the top from the small place of pure individual personality. We sense that there must be some unique individuals out there hiding from the rest of us who have managed to transcend the universal layer that forces us to eat, drink, sleep and mate. Out of respect for those beings, we do not dare guessing how to achieve that state. For us, it is already a lofty goal to get to the two-layered existence. Back to the topic. So, in order to create unique brands and designs, we need to think beyond culture.